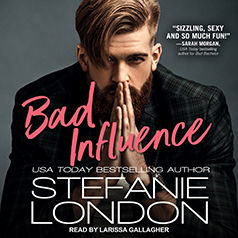 Stefanie London presents the third book in her Bad Bachelors series. Contains mature themes. He's the bad bachelor who inspired it all . . .
Annie Maxwell had her whole life figured out . . . until her fiancé left her when his career took off. If that wasn't bad enough, every society blog posted pictures of him escorting a woman wearing her engagement ring. To help the women of New York avoid guys like her ex, Annie created the Bad Bachelors app. But try as she might, Annie just can't forget him . . .
For bank executive Joe Preston, his greatest mistake was leaving the love of his life when she needed him most. Now, all he wants is to make things right—and she won't have him. But when Annie's safety is threatened by a hacker determined to bring down her app, Joe is the only one she can turn to. He'll have to lay himself on the line to prove to Annie that he's a changed man. But will their hard-won bond survive the revelation that Annie is the one pulling the strings behind Bad Bachelors?